Bring your world to the third dimension with these 3D virtual reality folding glasses. 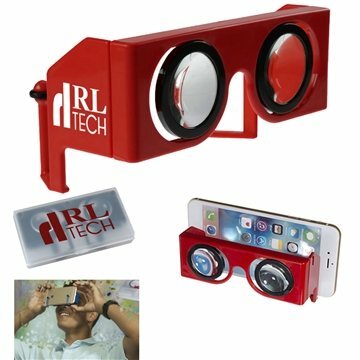 They fit most size cell phones and are used to watch a movie, game or video in 3D using a 3D or VR compatible phone. Imprint your company name on the case and/or VR viewer to promote film studios, theme parks, technology companies and more. Packed in a clear plastic travel case. Logo was printed correctly and on brand The product was perfect as well as good quality for the event. It looks exactly like the picture. Good value for a quality product. Delivered as promised. Veronica has bent over backwards on two separate orders for us! She was excellent. the image is perfect in one color or full color. Very professional. I was satisfied with the color of the blanket.